Canon Kevin George is an Anglican Priest at St. mark’s by-the-Lake church in Tecumseh, Ontario – just outside Windsor. 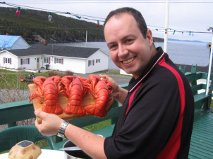 Kevin is a native of Newfoundland, having been raised in Whiteway, Trinity Bay.He received a Bachelor in Education from Memorial University of Newfoundland and a Masters in Divinity from Huron University College at the University of Western Ontario in London. In May of 2012 Kevin will receive his Doctorate in Ministry in Parish Revitalization from McCormick Theological Seminary in Chicago – with his thesis work having been rooted in Interfaith Dialogue. Kevin is committed to Ecumenism. This is evidenced in his marriage. Catherinanne is Director of Campus Ministry at Brescia University College, a Roman Catholic University at the University of Western Ontario. Kevin enjoys writing and maintains a regular blog at www.canonkevin.com He is currently working on a book of inspirational stories which he hopes to release at a book launch in Newfoundland later in 2012. A couple of years ago I made my first trip to the UK. I was really impressed with Westminster Abbey. The beauty, splendor and the fact that you are walking through the hallways of history, leaves you in awe for every minute spent there. At the great west entrance there are ten statues that celebrate the lives of twentieth century martyrs. To be honest, I was more than a little surprised when we visited there and I stumbled upon these memorials as I stood outside at the end of evening prayer. Having just been inside and having prayed next to tombs, monuments and memorials to people like William Chaucer, William Shakespeare, Sir Isaac Newton, Mary Queen of Scots, Edward the Confessor, (the list is extensive), it was a surprise to see likenesses of Dr. Martin Luther King, Dietrich Bonheoffer, Esther John, who were names well known to me because of recent history. Wow, modern day saints on the wall of this ancient abbey were an impressive juxtaposition. It is a great testimony to the idea that God is still speaking, still revealing and still inspiring hope. As I stood in awe of this magnificent place and thinking about the brave acts of Martin Luther King and Dietrich Bonheoffer, I began to think about how God speaks so powerfully to us even today. We look way back and talk of God’s love expressed through the lives of the Saints, but we forget that the community of saints still dwells among us and we are called into that community. We are also called to speak hope and love to a world that is engrossed at times with despair. One of the martyrs on that west wall is Maximilian Kolbe. Kolbe was a Franciscan friar who was killed at Auschwitz for helping Jews hide from persecution. The Nazis tried to starve Kolbe with 10 others. When he refused to dies and was the last man left living the Nazis killed him with an injection of carbolic acid. During his time of imprisonment he maintained his faith and was a source of great strength to fellow prisoners. How impressed I was to see Kolbe above that West entrance at Westminster Abbey. How wonderful that the Abbey recognizes the work that God continues to do by erecting statues to those that have paid so much in our recent history as a testimony to their faith. Maximilian Kolbe wrote – “A single act of love makes the soul return to life.” His life was marked by acts of love. What about our lives? Do we realize that God wants us to live among the community of saints? Are we aware that our actions can be an important part of what God wants to accomplish today? I write this not because I think we should see ourselves as self important, but because even in the act of loving we have so much opportunity to bring about change and hope in the life of another human being. Kolbe reminded us what a Christian witness is all about. He did that for us not just by dying as a martyr, but by living as a saint. We need to remember that our lives also need to be about witnessing to hope. That witness may be as simple as a ‘single act of love.’ The act of love brings the soul to life…Kolbe does not specify which soul. It could be the soul of the one offering the single act of love or the one who receives love when she so desperately needs it. Either way – we see that loving brings life. Let us all ask what single act of love we might embrace today? 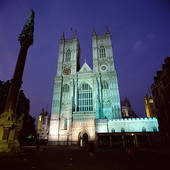 I wonder who will be memorialized at Westminster Abbey 50 years from now. Stay tuned! I grew up in the same parish as Kevin and know some of his family. I remember the great celebration when he first became a priest. It is wonderful to hear how he is doing. His writing is certainly powerful! Can’t wait to see that book later this year! Me too, Beverly, I also look forward to seeing his book. That is nice to hear – Thank you Beverly. We will keep everyone posted on the book! Thanks for featuring my writing on your page! “…because even in the act of loving we have so much opportunity to bring about change and hope in the life of another human being.” This is going in my journal so that I can remind myself the importance of loving those around me. And not just those that I am “supposed” to love, but all those God places in my path each day. Fantastic post by Canon Kevin!